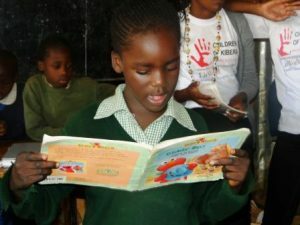 Spurgeons Academy, which is part of Spurgeons Childcare Kenya, is a partner of CRED Foundation located in the Kibera informal settlement of Nairobi, Kenya. It’s managing director is Kenyanito Dudi, and over the years many CRED Teams have visited the school to deliver educational activity weeks, and be life-transformingly inspired at the same time. The school prides itself on being accessible to all children, no matter what their financial or social background, and approximately 80% of the pupils are single or double orphans. Many of the children live with extended family, or in child-headed households, and the school employs a social worker to provide the required support to the pupils and their families. As well as giving the pupils a high-quality education, the school provides two meals a day for the children, access to medical care when needed, and also offers a range of extra-curricular activities including ballet, gymnastics, art and various sports clubs. Many of the children are sponsored, but more sponsors are always being sought to ensure guaranteed financial security. 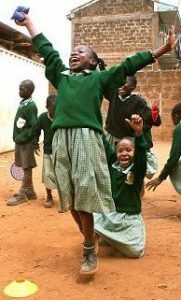 Below, written by Kenyanito, is the story of twin sisters Lily and Vivy, which gives insights into some of the issues that the pupils of Spurgeons are up against, and which the Spurgeons staff help the children overcome. Lily Chagwe and her twin sister Vivy Liabeya were born in July 2011.. While the birth of a baby always brings joy to the family, for Lily and her twin sister it was the opposite. In addition to being born out of wedlock, the community they were born into considered twins as a sign of bad omen to the family therefore, the two faced rejection right from birth. This rejection also came from their mother who looked on them as an impediment to her getting married because it was clear in her mind that no man would be willing to marry somebody with twins! To keep her hope of getting married alive, the mother disowned the children and instructed them never to name her as their mother even though they were all staying in the same house, with their grandmother, in the slums of Kibera. Three years later, the mother was in a relationship that was leading to marriage. The man had no knowledge that his would-be wife had a child, let alone twins, and this only escalated the twins’ predicament. Since rumors spread like bush fire, the truth finally reached the man. He was very categorical and asked the twins mother to choose between the children and marriage. Since she was desperate for marriage, she abandoned the children and got married to this man. He attached conditions to the marriage, which meant that the grandmother had to take full responsibility of Lily and her sister Vivy. Being a widow who only earns a living by occasionally washing clothes for people in exchange of some little money and with four other children of her own to take care of, the grandmother struggled to bring in enough money for even the most basic needs and it was very difficult for the children to go to school. 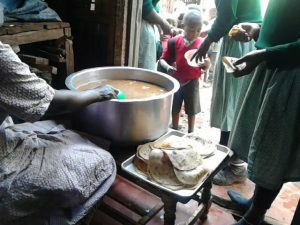 She tried enrolling them in many schools without success because the grandmother could not afford school fees leave a lone uniform and learning materials and not to mention food!! Spurgeon’s organization came to their rescue after their case was presented by the school social worker and approved by the Project Manager. Lily, together with her sister is now happily learning at Spurgeons Academy after being enrolled into the Childcare programme. They not only get free quality education but also love, textbooks, stationary, psychosocial support, medication, clothes, uniforms, food and nutrition. They get two meals at school – breakfast and lunch – and occasional food baskets. By these, we have been able to build self-esteem, resilience and hope to this family. “ I am so glad to God for Spurgeons Academy and the sponsors” said Lily. “Today, I would be out of school if it was not for their support”.